This is where the problems associated with TOS occur. That's the first rib. Right side body pain that travels. Can tos start on outside of wrist joint and top of shoulder then after several months has spread to ribs,clavicle,under shoulder blade and side of neck and now feels like side of face is tingling? 53 year old female smoker,active,likes to walk ,no loss of weight or appetite,no dizziness,slight swelling in all these areas and some days pain is mild for 4 or 5 days but if lift heavy or over use of hand pain is worse for 3 or 4 days. With worse pain being under shoulder blade and wrist and ribs. Thank you so much for an opinion. 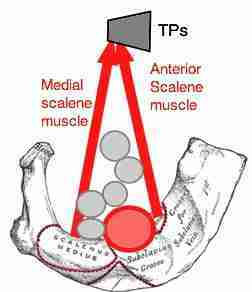 Thoracic outlet syndrome will not cause swelling anywhere. However, a swelling around the collarbone can be the cause of TOS. So the swelling in your wrist is likely to be a local problem, unconnected to the neck region. Shoulder pain certainly can be related to TOS, but you can't assume so unless there's a positive Adson's test, and the symptoms in the arm are worse with the hand above your head. Does turning your head and then looking up cause pain anywhere? Is the ribcage pain in the midback, under the armpit, or in the front at the sternum? Does taking in a deep breath, or coughing ever cause rib pain? As you can see it's complex. Add to it all the conditions caused by smoking and you have a diagnostic nightmare. At this stage, I wouldn't assume these symptoms are caused by TOS. Those local areas of swelling need to be examined, and may need more tests; in particular any swelling around the collarbone. I'm sorry I can't be more helpful. I realise this reply is full of ifs and maybes and is very guarded. Why not give up smoking permanently? There's still time but quite soon things are likely to turn S-H-one-T. It can be done. Yesterday I treated a man of your age who quit a few years ago of his own accord. The victory is won between the ears. Once the decision is made, it's not that difficult. Good luck, I hope this contributes in some small way.